Beat your egg into a large bowl and then add the other ingredients. Mix well (your hands are best for this) until everything is evenly incorporated. 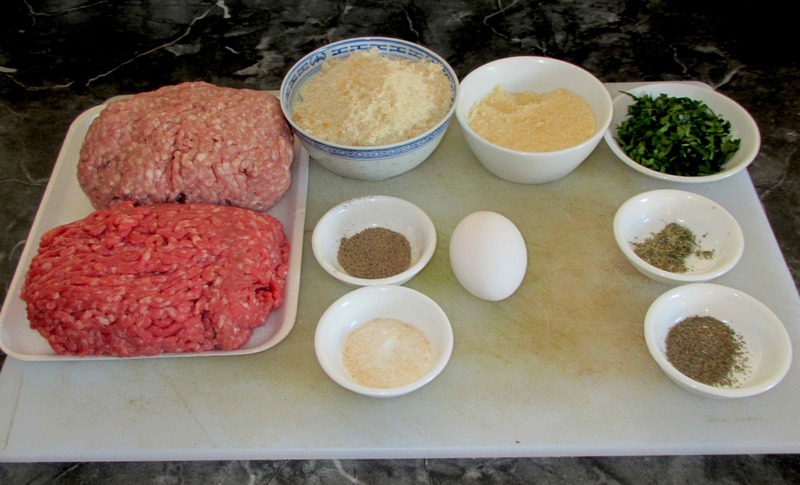 Now form the meat mixture into eight balls and set aside. These are the sausages I will be using. 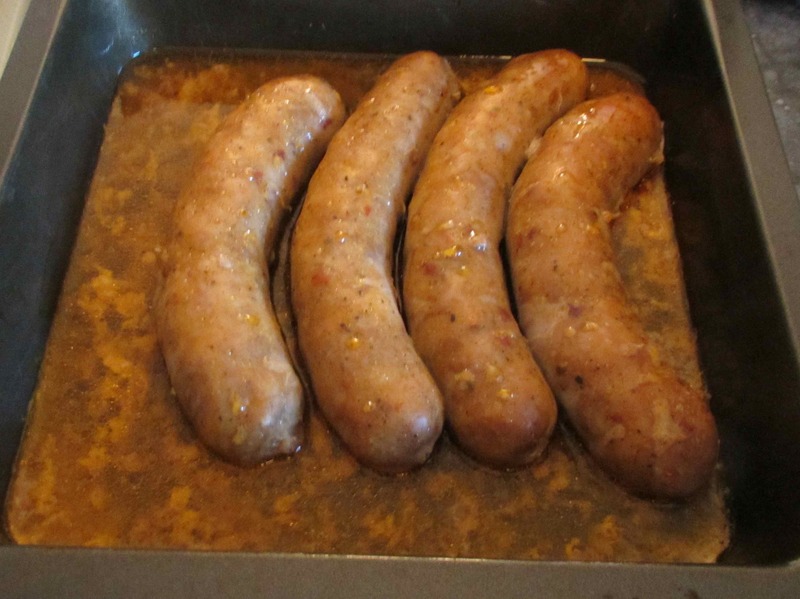 They are a variety of Hot Italian Sausage from our local store that my wife and I have enjoyed before. One thing about them, however, is that they throw off a lot of fat that will make your sauce cloyingly greasy so it is a good idea to get rid of as much as possible beforehand. 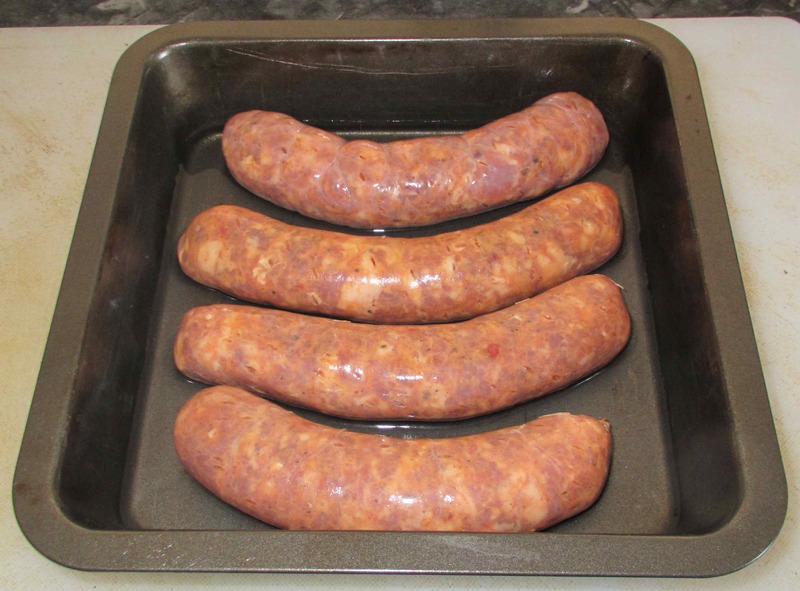 Here, I have pricked the sausages all over with the tip of a sharp knife and put them in baking pan to which I have added about a half-cup of water. 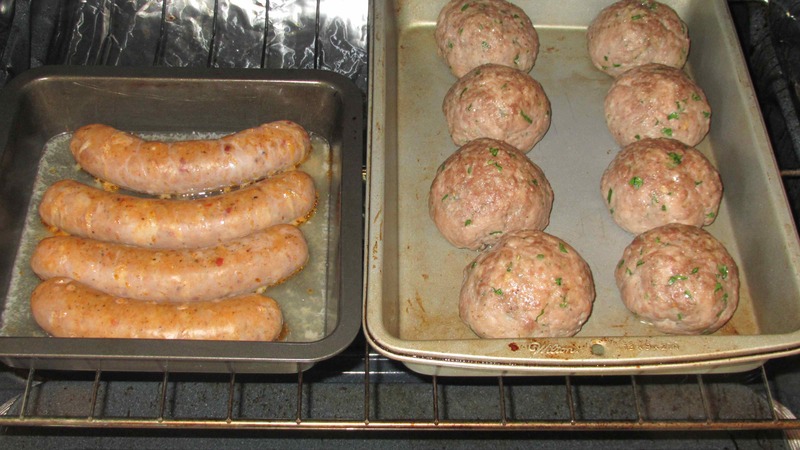 Pre-heat your oven to 350 degrees and then pop in the sausages and meatballs inside. 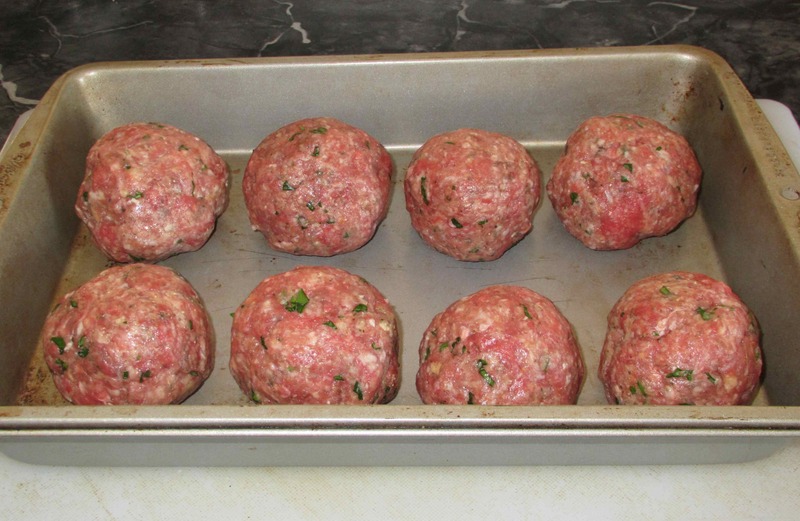 Cook, turning both during the process just until the meatballs are lightly browned on the outside. 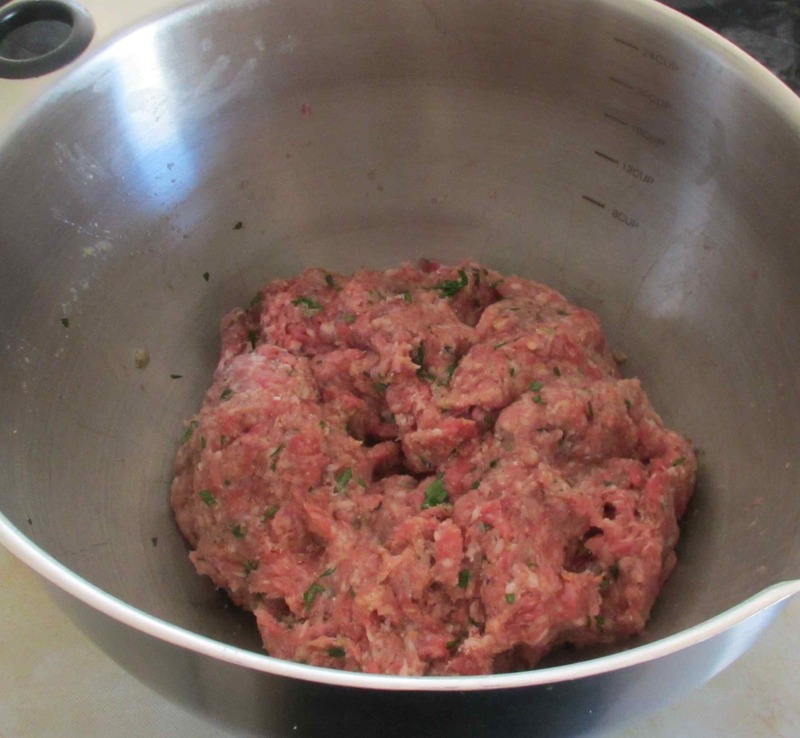 This will only take about twenty minutes or so and the balls will still be uncooked in the center. The sausages should be left in a little longer, though (about 30 minutes or so in all), as you want to draw as much grease as possible. As you can see, a lot of fat was released. You may wish to rinse the sausages off after draining the grease away. 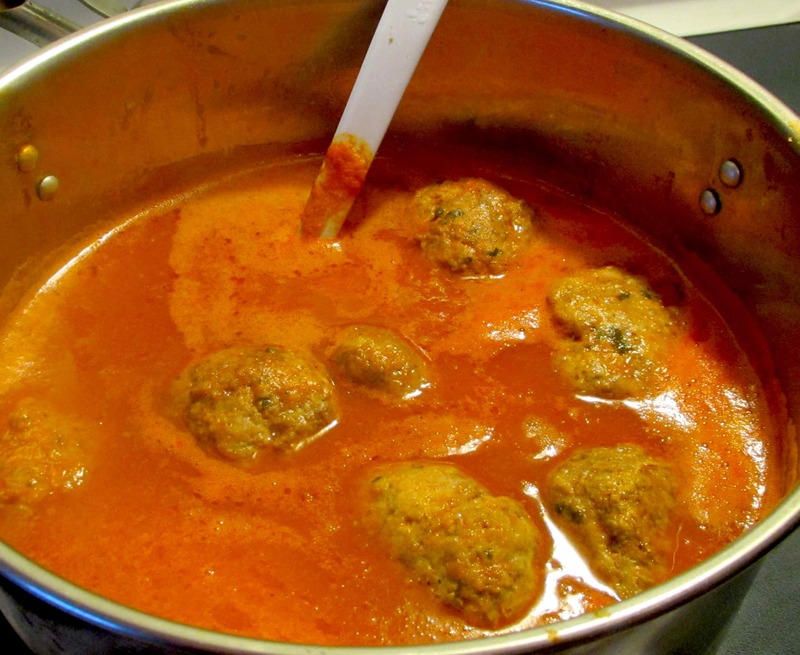 Finally, bring your tomato sauce to a good vigorous boil, add the meatballs and sausages, and turn your pot down to a low simmer. You have quite a bit of latitude as to the cooking time but anywhere from one to two hours will be about right. 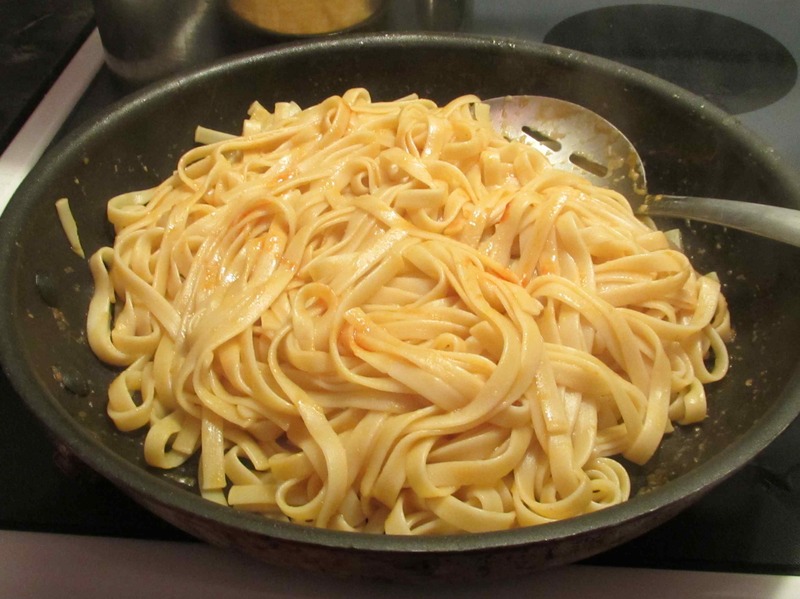 In any event, you will have plenty of time and not be rushed when it comes time to cook the pasta. For this meal, I used Fettuccine (because that’s what I had) but Penne and Rigatoni are quite popular. The pasta was simply boiled in salted water until *almost* al dente and then drained (you don’t really need pictures for this, do you?). Anyway, the next trick is to heat a few tablespoons of butter in a pan, add a cup or so of the ‘gravy’ and then add the pasta. Cook over high heat until the sauce is just about absorbed, transfer to a serving bowl and top with just a splash more sauce with a little parsley for garnish, if you like. Now, fish your meats out of the sauce and put into a serving platter. You can, if you want, serve them on top of the pasta but it is more traditional to serve them separately. Indeed, in many families, the pasta is eaten first and the meats as a second course, sometimes just with extra gravy and some bread, sometimes with other ‘sides’. However you do it, pass extra sauce and lots of grated Parmesan at the table. The whole idea of this project, of course, is to build up layers of flavor in our gravy over time. However, I am not going to be cooking with it every day and there will be times (a week or so at a stretch while I am travelling) when it will remain sitting. Freezing is possible, but the alternative is to simply bring the gravy to a boil every three days or so and then chill it again as this will keep it fresh indefinitely. I will keep a record of these steps and update you as our project continues. Also, it will also be necessary to remove fat as it accumulates but this can be done most easily when the sauce is chilled. Congrats on your 100th experiment! Since you are a veteran cook, it is no longer an experiment! This dish looks very yummy. i love meatball spaghetti/pasta! Congrats on the 100. 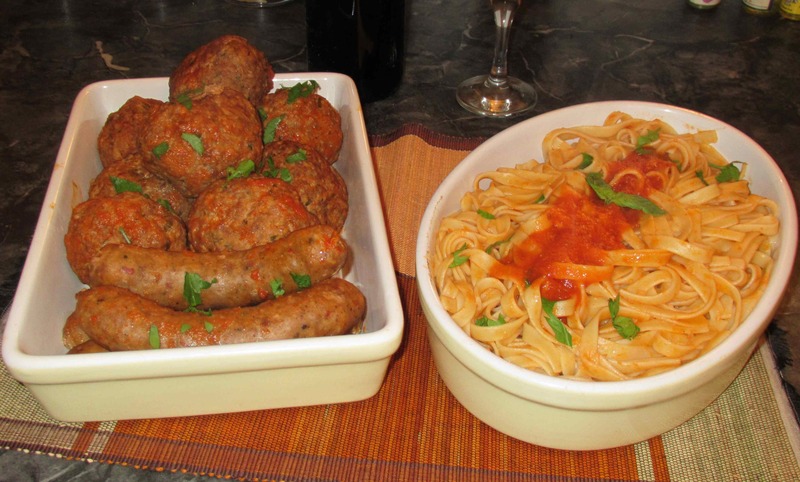 Sauce and meatballs look great! This is a dish I love and make fairly often though not with an ongoing sauce as you are. I’m very interested in following this experiment in the days ahead. I love this and i am still looking for a vegitarian option that tastes just as good! 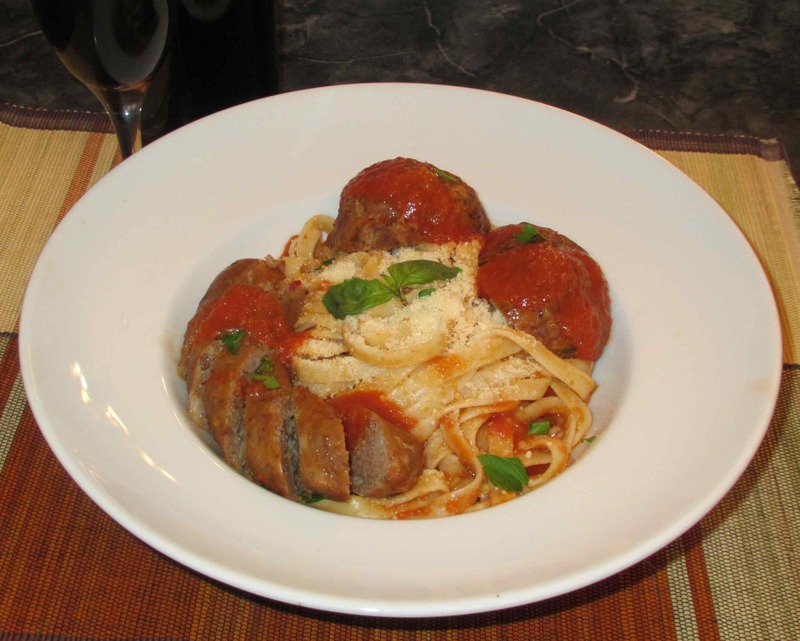 Those meatballs look like something I’d see in South Philly….two thumbs up! Congratulations on your 100th yummy post! This experiment was a huge success!